George Tan, of Avenue Y in Brooklyn, has some interesting trademark applications to the US government. Under the subjects of ‘Recorded video game programs, Posters, Household linen, including face towels, T-shirts for adults and children, Fantasy character toys and Entertainment services in the nature of development, creation, production, distribution, and post-production of motion pictures, television programs, multimedia entertainment, live stage productions, and theme park rides’ he has recently registered such names as G.I. DRAGON and G.I. THAI. 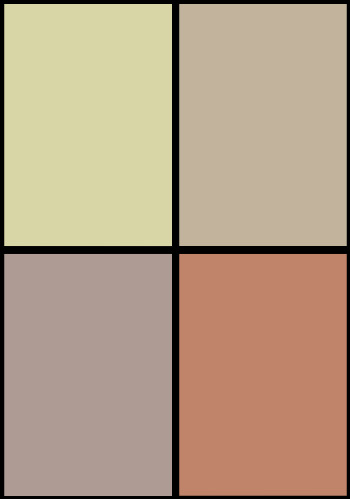 Might Hasbro be interested in this at all? He has also claimed registrations under the same qualifications for TIMMY THE TIMID GHOST, SHAOLIN BEASTS and most entertainingly, CAPTAIN ATOM. 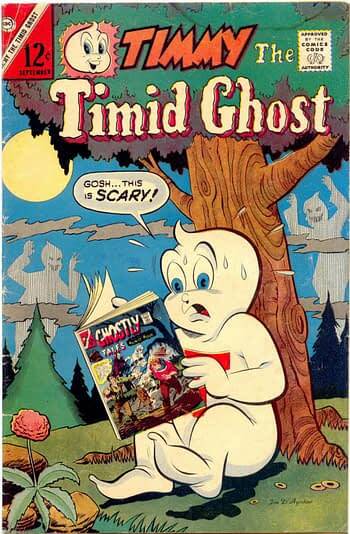 Timmy The Timid Ghost was a Charlton character created by Al Fago, published originally in the 60s, with a brief revival in the eighties. Trademark-wise, he must be up for grabs. Shaolin Beasts is a little close to Beast Warriors of Shaolin published by Pied Piper in the eighties, and again, grabbable for trademark reasons. 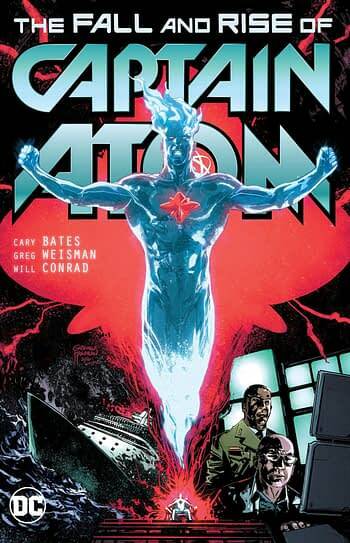 But Captain Atom is the Steve Ditko created character for Charlton Comics, bought by DC Comics and most famously known as the basis for Dr Manhattan, though DC has continued to publish Captain Atom comic books and the character still occurs in a very trademarkable form. I wonder if Warner Bros’ antennae have picked this up? Because they may also look at his attempt to register HOPPY THE MARVEL BUNNY. Created by Chad Grothkopf in 1942 for Fawcett’s Funny Animals, he was a comedy spinoff of Fawcett’s Captain Marvel, now better known as Shazam. 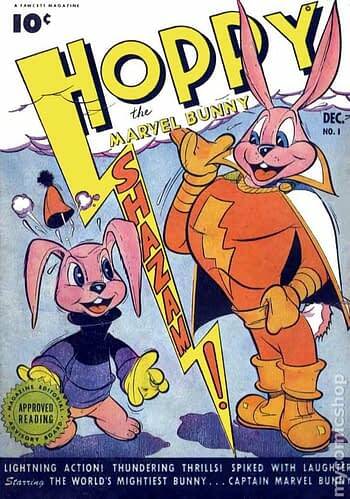 Hoppy later became a property of DC Comics and has made periodic appearances in stories related to Captain Marvel. In the most recent revival Hoppy is accidentally struck by magic lightning when Mary and her foster sister Darla Dudley say “Shazam!” and assume their superhero forms. 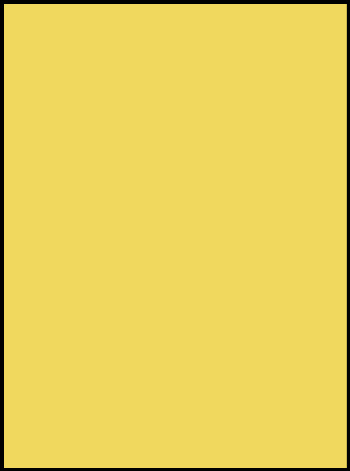 As a result, Hoppy acquires super-powers (flight and lightning-emitting eyes, among others) and his fur pattern reflects the lightning-bolt emblem of the Shazam Family. Others registrations of his of late include PETER WHEAT, BILLY BLASTOFF and SUPER MOUSE. The toy line known as Billy Blastoff incorporated several versions of a four-inch-tall, plastic, child-faced adventurer produced by Eldon in the late 1960s and early 70s. 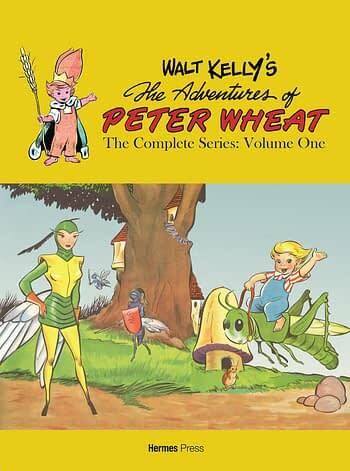 Peter Wheat is a superhero created by Walt Kelly fo the Peter Wheat Bread Company in 1948 as a comic book to promote their brand. 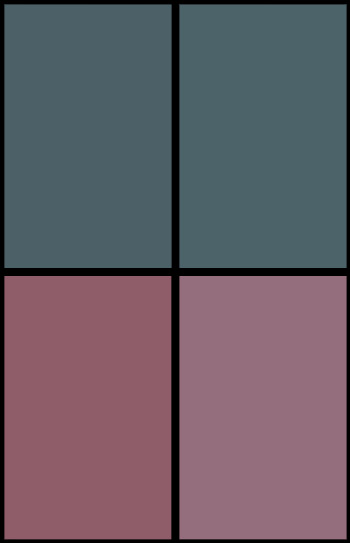 Neither company or character are around today, but they were recently republished by Hermes Press. And Super Mouse was the original name of Mighty Mouse before DC Comics had words. I will be looking forward to the legal letters fly. George Tan, represented by Paul S Levine, has previously registered the now-dead trademarks BIG WILLIE, TIGER MAN, HILLBILLY CAT and RAP NATION for clothing, namely jeans, t-shirts, sweatshirts, boxers, jerseys, polo shirts, and jackets, a decade ago. I wonder what he’s planning to do?